To say 11 April 2019 was a banner day for SpaceX would be an understatement. 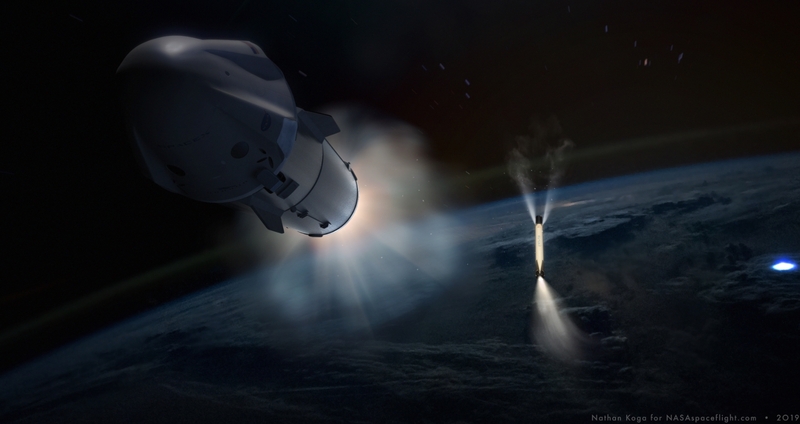 The private space company that has soared into the public’s imagination and trust not only succeeded in launching its Falcon Heavy rocket – the most powerful currently operational rocket in the world – on its first commercial flight, but also – just 70 minutes before that launch – secured yet another first: the launch contract for the first-ever spacecraft impact asteroid redirect mission. Good things come to those who wait – and especially to rocket companies that respect mother nature and don’t launch into “no go” weather conditions. While some were certainly disappointed in the need to stand down from Wednesday’s end-of-window launch target of the Falcon Heavy, reward was around the corner. Launching into a nearly cloudless sky, the first operational flight of SpaceX’s Falcon Heavy rocket – and the vehicle’s all Block 5 debut – proved yet again the talent and ingenuity of SpaceX’s engineers. By all accounts, the mission was flawless: a perfectly smooth countdown, fueling, and liftoff right at the opening of the launch window. Precisely, Falcon Heavy’s first motion off LC-39A was registered at 18:35:00.526 EDT (22:35:00.526) on 11 April 2019. A marked difference from last year’s debut, this Falcon Heavy did not undergo a staggered start sequence of its 27 Merlin 1D engines. Instead, all 27 engines lit at once at T-2 seconds, imparting 5.1 million lbf of thrust into LC-39A before leaving the launch pad. The Block 5 Falcon Heavy’s thrust then increased to a maximum of 5.5 million lbf of thrust as the rocket ascended out of Earth’s dense lower atmosphere and into vacuum. After a 32 minute 4 second flight, Falcon Heavy deposited the ArabSat-6A telecommunications satellite into a super-synchronous Geostationary Transfer Orbit – sending the satellite on its way to a 15 year operational lifespan to bring phone, TV, voice, text, and digital communication services to the Middle East, Europe, and Africa. 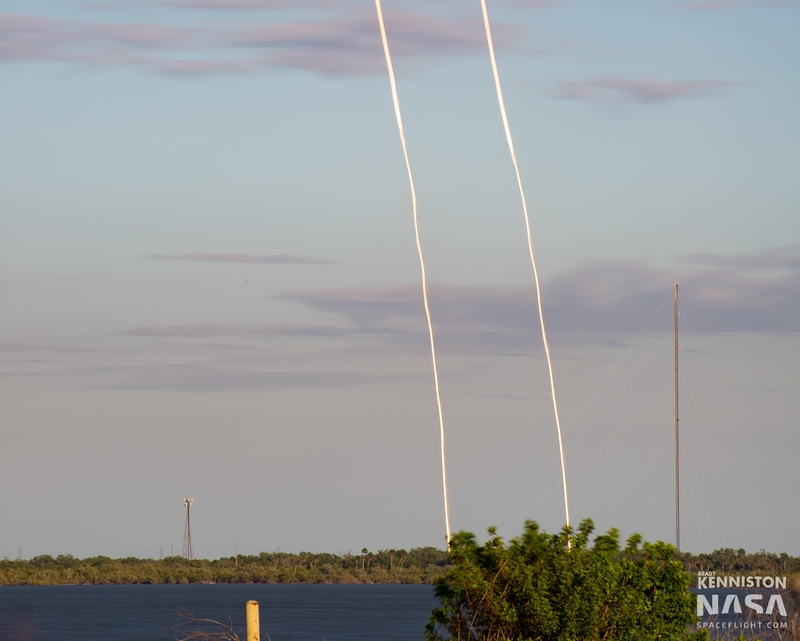 Adding to the splendor of a perfect mission to bring ArabSat-6A to orbit, the twin side boosters flew themselves back to the Cape Canaveral Air Force Station for synchronized landings at Landing Zones -1 and -2 (LZ-1 and -2). The center booster continued downrange and stuck its landing on the ASDS (Autonomous Spaceport Drone Ship) Of Course I Still Love You 976 km downrange in the Atlantic Ocean. The drone ship landing was the farthest downrange landing ever attempted by SpaceX to date of a Falcon booster – more than 300 km farther downrange than the previous farthest landing. Adding even more to the mission’s secondary objective successes was the picture-perfect splashdown of the two payload fairing halves into the Atlantic. The fairings were plucked from the water by SpaceX support ships, and Elon Musk soon confirmed that these would be the first two fairing halves to be reused. That first fairing reuse will come “later this year” on an in-house Falcon 9 launch of a batch of SpaceX Starlink internet satellites from SLC-40 at the Cape Canaveral Air Force Station. Exactly which Starlink mission that first fairing reuse will occur on was not revealed. All-in-all, the launch, landings, and recoveries are a testament to the engineers throughout SpaceX – from design to build to processing to testing to flight trajectory – who made this vehicle a reality. SpaceX has a way of making the incredibly challenging look immensely easy. It is not. Behind all of Thursday’s success is hundreds of thousands of personnel hours and personal sacrifices to deliver Falcon Heavy for their customers. With its first operational mission behind it, processing is already well underway for Falcon Heavy’s next flight, currently targeting NET (No Earlier Than) June 2019 – just two months from now. The third Falcon Heavy flight will reuse the same two side boosters (B1052 and B1053) that launched and landed Thursday. However, the center booster for the third Falcon Heavy is understood to be a brand new booster, B1057. 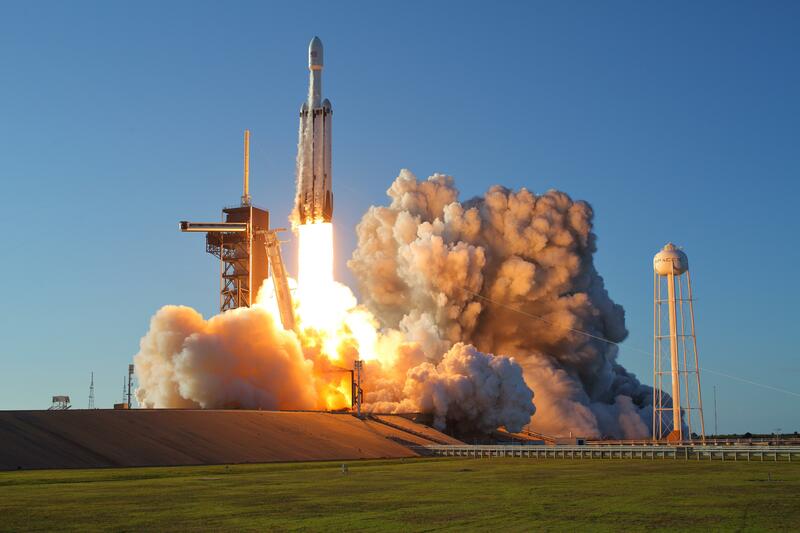 The third Falcon Heavy will lift the STP-2 (Space Test Program -2) mission to Earth orbit for the U.S. Department of Defense (DoD) along with a variety of rideshare – or secondary – payloads. Of those rideshare payloads, a notable one is the Planetary Society’s Lightsail 2 mission which will continue to test solar sailing via the use of reflective sails to harness the momentum of sunlight for propulsion. Falcon Heavy wasn’t the only success SpaceX had on Thursday. Just 70 minutes before Falcon Heavy took flight, NASA announced the U.S. space agency had awarded SpaceX a critical contract to launch the Double Asteroid Redirection Test (DART) mission. DART will be the first mission to demonstrate and test the effectiveness of slamming a spacecraft into an asteroid to change it orbit. The mission is considered a critical step in planetary defense preparations should the need to deflect an asteroid on a collision course with Earth arise. Per the NASA announcement, the launch contract with SpaceX is worth $69 million and will see SpaceX launch the DART spacecraft on a Falcon 9 rocket from SLC-4E at Vandenberg Air Force Base, California, in June 2021. 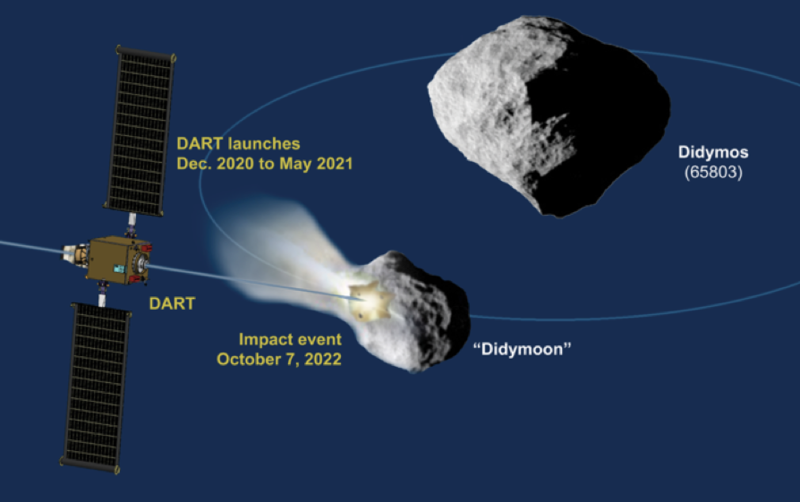 A launch in that time frame will allow DART to intercept the asteroid Didymos, specifically its small moon, in October 2022 when the asteroid will be within 11 million kilometers of Earth. This intercept time is crucial as ground-based telescopic observations and planetary radar will have to be used to measure the change in momentum imparted into Didymos and its moon to determine the effectiveness of the asteroid kinetic impact deflection technique. Therefore, the mission’s entire purpose is to slam the 500 kg DART spacecraft into Didymos’ small moon at a velocity of approximately 6 kilometers per second. The impact will change Didymos’ moon’s orbital velocity by 0.4 mm/s – which will in turn change the gravitational balance the asteroid system currently enjoys and alter Didymos’ solar orbital velocity by 0.5 mm/s – or 10 minutes per solar orbit. While that may not appear to be much of a change, if the same velocity change were imparted to a hazardous, Earth-bound asteroid, it would mean the difference between the asteroid hitting Earth and missing Earth by tens of thousands of kilometers. For clarity, Didymos is not an Earth-hazardous asteroid, and altering its orbit by such a small amount will not cause it to become a threat. Therefore, it is the perfect target asteroid for this type of kinetic deflection test. Due to its only mission objective being to slam into Didymos’ moon in a mission-ending impact, DART will not carry scientific instruments and will instead only bear a Sun sensor, a star tracker, and a 20 cm aperture camera for autonomous navigation to its impact target. NASA’s primary DART mission page, which has not yet been updated to reflect the contract award to SpaceX and the new launch date, shows the mission was originally expected to launch between December 2020 and May 2021 as a rideshare on a commercial or military mission where the primary payload was heading to Geostationary Orbit. That would indicate that NASA had originally planned to launch DART on either a SpaceX Falcon 9 or Falcon Heavy or a United Launch Alliance (ULA) Atlas V or Delta IV Heavy from Florida. However, either no GEO mission was available in that timeframe or NASA decided it would be cheaper and more efficient to purchase a rocket specifically for DART. Given the potential range of options and the limited launch budget, a SpaceX Falcon 9 appears to be the ideal choice not only due to its low launch cost but also its ability to first launch the mission into a polar orbit from Vandenberg Air Force Base and then direct DART onward to its asteroid target and correct heliocentric orbital inclination. This type of polar orbit insertion before redirect into a heliocentric transfer orbit was previously seen via ULA’s launch of the Mars Insight mission for NASA in 2018. Indeed, selection of a specific launch vehicle for only DART ensures the mission will not fall victim to potential delays if the primary satellite it was to have hitched a ride with encountered issues. Moreover, there is also a proposal from the Italian Space Agency (ASI) to include a secondary spacecraft called LICIA (Light Italian CubeSat for Imaging of Asteroids) along with DART. LICIA would act the same way the Marco spacecrafts acted for NASA’s Insight Mars lander, piggybacking with DART, separating shortly before impact, and acquiring images of the impact and ejecta while communicating telemetry and images directly back to Earth. Presently, LICIA has not been formally approved; however, NASA and the Italian Space Agency are working on the CubeSat communication relay idea to determine its effectiveness for the DART mission. 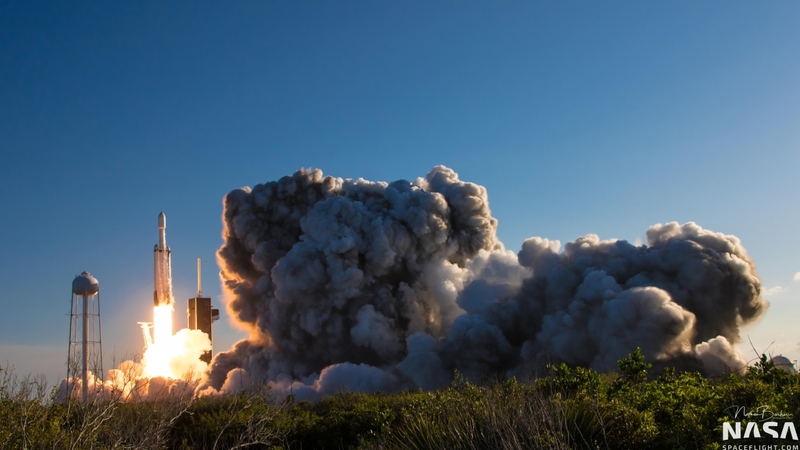 From SpaceX point of view, securing a launch contract for a Planetary Defense mission is an important step for the company and a continuation of its fruitful partnership with NASA. Additional, the SpaceX press release noted, “SpaceX has a record-breaking, proven operational cadence, demonstrating its rapid, responsive, and reliable launch capability. “To date, Falcon 9 has completed 68 launches, including two NASA LSP missions Jason-3 and TESS, 16 Dragon Cargo Resupply Services missions to and from the International Space Station, and this year Falcon 9 will help return human spaceflight capabilities to the United States for the first time since the Space Shuttle program ended in 2011.